Who Is this Man, and Why Was He So Hated? 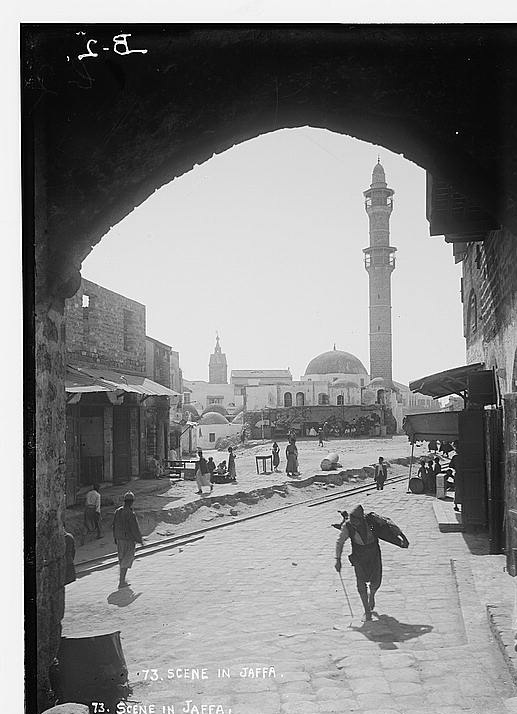 Until their defeat in 1917, the Turks ruled Palestine, often with an iron first. The American Colony photographers maintained a photo album of the last years of the Turkish control. Of this man, Hassan Bey, the album bore this caption: "The Tyrant of Jaffa." The opinion was shared by the Jews of Palestine who were often rounded up and in many cases expelled from the country. Turkish rulers were particularly harsh against "Zionists" who were often viewed as "separatist" agents for foreign countries like Russia. The harshest and most cruel of all the Turkish officials was the Commandant of the Jaffa district, Hassan Bey. He was the very type of an Oriental satrap. It would suddenly come into his head to summon respectable householders to him after midnight, and hours after they would return to their expectant families with an order to bring him some object from their homes which had caught his fancy or of which he had heard — an electric clock, a carpet, etc. Groundless arrests, insults, tortures, bastinadoes [clubs] — these were things every householder had to fear. ﻿Hassan Bey also had an ambition to beautify the towns. For this purpose he suddenly had whole rows of houses pulled down without offering any reason, and forced the owners to sign legal documents stating that they gave up all claim to their property. Both they and the other inhabitants were compelled to provide building materials and money. He forced the laborers under threat of the lash to give work without payment. 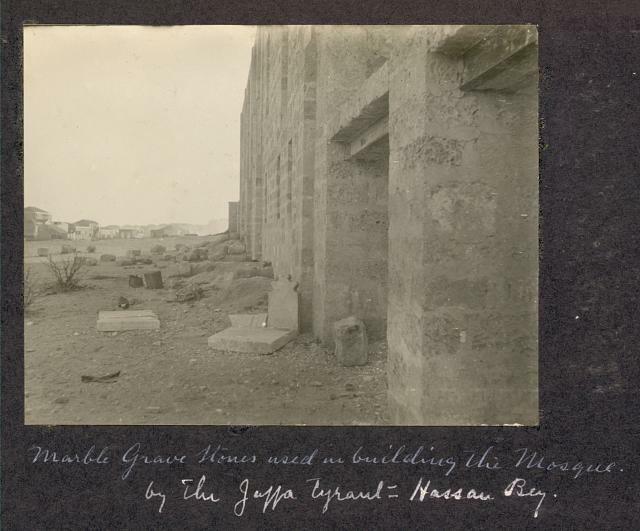 Hassan Bey continually demanded from the Jewish institutions money for and active participation in the execution of public works (building of a mosque in Jaffa, erection of the Mohammedan schools founded by him, etc.). The Jewish communal committees particularly excited his wrath. 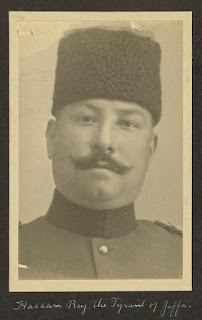 When Hassan Bey presented a demand to a colony, he usually reinforced it with a threat to attack the colony with his soldiers and wipe it out if his request was not fulfilled. 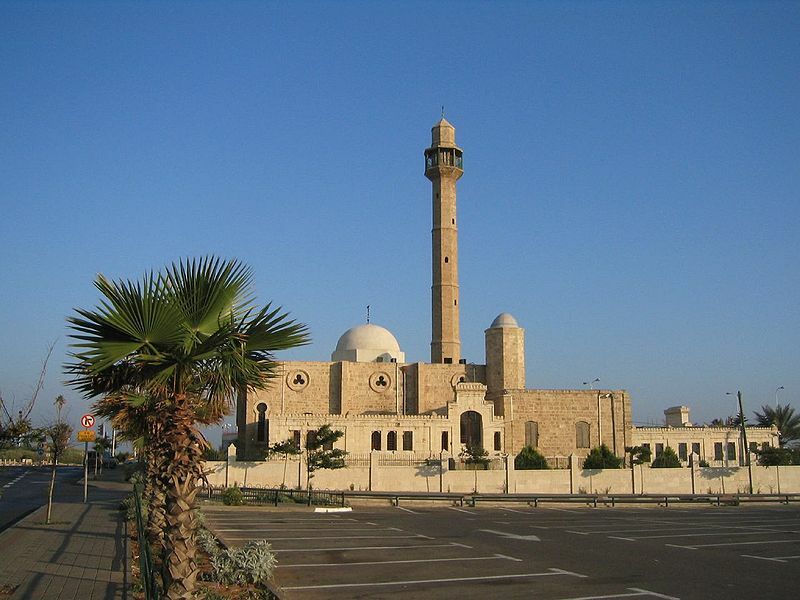 The mosque referred to is the Hassan Bey (also known as the Hassan Bek) Mosque between Jaffa and Tel Aviv. 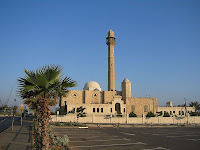 Hassan Bey intended to limit the growth of Tel Aviv southward, so he placed the new mosque north of Jaffa. Repeatedly interceding on behalf of the Jews of Palestine in 1914 were the American ambassador to the Ottoman Empire, Henry Morgenthau Sr., and the American Consul General to Jerusalem, Otis Glazebrook. When the American naval cruiser, the USS North Carolina, was dispatched to Jaffa to bring $50,000 to the desperate Jewish community. Morgenthau lobbied hard to block Hassan Bey's attempts to steal the money. But you left out the most important matter: genocide. In the spring of 1917, he expelled upwards of 5000 Jews from Tel Aviv & Jerusalem. Hundreds dies.